Use parameter modulation to create clearer mixes. One of the supreme challenges of mixing is to convince your listeners that all of the tracks that they are hearing really do belong together. Just mixed together and left to their own devices, they may seem to be all fighting for attention or obscuring each other. A special challenge can be getting the vocals to sit just nicely above the mix and yet still be part of it. Probably, you're already using panning and volume (including envelopes) to help overcome this. Certainly, giving each part its own space in the mix and getting your relative volume levels right are two essential tasks. However, tweaking volume envelopes can be time‑consuming and frustrating. 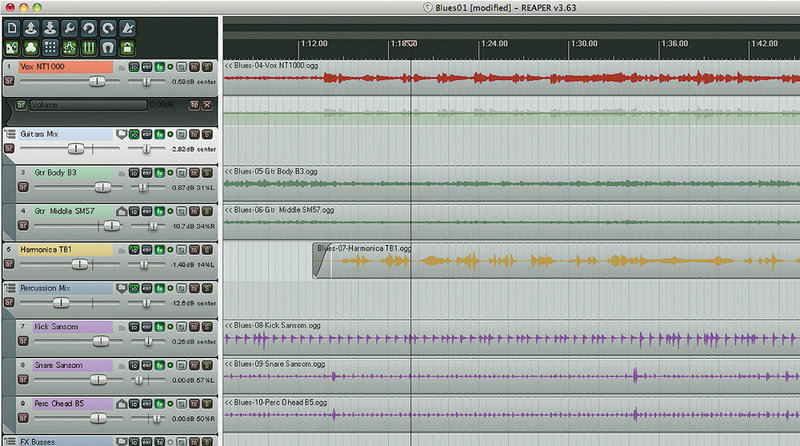 Make a small adjustment to one track and you find yourself having to also adjust half a dozen or so others. Compression can help, but here you run the risk of damaging the dynamics of your music. That's where Reaper's parameter modulation feature can come to your rescue. 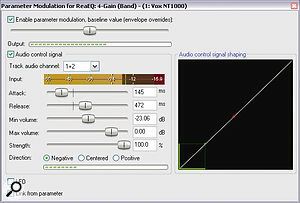 Parameter modulation allows the normally static values of parameters within effects and processes to be varied in real time by sources such as the level of an audio track or an LFO. This is rather like the side‑chaining feature found in most DAWs now, but goes much further in that it can be used to control almost anything, rather than just the dynamics processing for which side‑chaining is most often employed. Some simple examples of parameter modulation are covered in the Reaper User Guide. In this article we're going to take you beyond these. At this point in the song (around one minute and 12 seconds through), all the elements will be getting in the way of each other. We'll use parameter modulation to change this.Here's a demonstration of parameter modulation in action, in which I've used the changing level of the lead vocal to dynamically EQ not just the vocal itself but also the accompanying harmonica part. Open the sample project file, Blues01.RPP (see box for download details). This file is intended to illustrate potential applications for parameter modulation. Save it with a new name. Hold the Ctrl key while clicking on the Master FX bypass button. This sets all effects to bypass. Release Ctrl and click on the Master FX bypass button again (to re‑engage the effects there). Play the song from about the one minute, 12 second mark. You should notice the various instruments getting in the way of each other and of the vocal. Now re‑engage all the track effects and play the song again. The parts should blend together much more sympathetically. In particular, the various percussion and guitar parts can be heard more clearly than before and the harmonica and vocal should no longer be locked in a life and death struggle. In no small part, this is due to the use of parameter modulation. As you play the song, open the effects chain for the vocal track. This includes a compressor preceded by EQ. Watch the EQ window, especially from two minutes, 45 seconds onwards. From time to time you will see an attenuation around the 3500Hz mark. This is where parameter modulation is being used to lower the gain at those frequencies where the vocal is most present, during those parts where the track is loudest. This is done to avoid triggering excessive gain reduction in the vocal compressor at those points, while allowing us to maintain the average level of compression that we want during the rest of the track. Let's see how it's done. With the effects chain for the vocal track still open and ReaEQ still selected, click on the Param button, then FX Parameter List, then FX Parameter Modulation, then 4‑Gain (this item should already be ticked). This will cause the parameter modulation settings window to be displayed. The controls are as follows: This screen shows the control settings used to blend together the instruments used on Blues01.rrp. Enable parameter modulation baseline value: This needs to be enabled, otherwise parameter modulation is set to bypass. Setting it halfway along the line means that the baseline gain for Band 4 EQ will be zero. Moving it to the right would give us positive gain, to the left, negative. This control needs to be interpreted differently according to the parameter being modified. Audio control signal: This is enabled, and the audio stream on channels one and two has been selected for this. This is the vocal track's own audio stream. Later you'll see examples of how, by using different audio channels, you can use parameter modulation for side‑chaining. Attack and Release: These work in a similar fashion to attack and release on a compressor. A low attack value causes changes in the EQ gain to be made more abruptly, a higher setting more gently. The greater the value of release, the longer the change is held. Min Volume: This behaves rather like a threshold setting. In this case, the parameter modulation will only begin to be applied when the vocal signal reaches ‑23.06dB and above. Note that this refers to the strength of the signal as it enters ReaEQ, not the signal shown on the track's VU meter, which is post-effects. Min Value and Max Value: As the former is a threshold, the latter can be thought of as a ceiling. The setting doesn't have a great deal of effect here, but in some of the examples it will be critical. Strength: This determines how strong the relationship is between the strength of the audio control signal and the parameter being controlled. In this example, at 100 percent, for every decibel by which the audio control signal changes, the parameter being controlled (in this case Band 4 EQ gain) will, potentially, be modified by a full decibel: a ratio of 1:1. A strength of 50 percent would create a ratio of 2:1, 25 percent would create a ratio of 4:1. These ratios are, themselves, likely to be modified by other settings. Direction: This setting defines the nature of the relationship. In this case, negative has been selected. This ensures that as the audio control increases, the value of the ReaEQ Band 4 Gain will be attenuated. We'll look at Link from Parameter and Audio Control Signal Shaping in future examples. None of the examples used in this article will use the LFO-shaping feature. Taking parameter modulation further, it can also be used when side‑chaining. In case you're not familiar with this concept, here's a quick run-down. Click on the IO button for the Guitars Mix and you'll see (from the routing window) that this track has been assigned four channels, with a receive from the vocal track coming in on channels three and four. 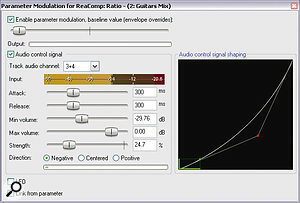 Open the track's effects chain and select ReaComp. Play the song. The signal from the vocal track (Auxiliary Input) is being used to control the compressor so that the guitar mix signal is gently compressed behind the vocal, a process known as ducking. One problem is that the louder the vocal becomes, the greater the degree of compression applied to the guitars. We risk compressing the guitar tracks too much. To compensate for this, parameter modulation is used here to reduce the compression ratio automatically whenever the vocal is louder. Here we can see the parameter modulation settings used to control a compressor ratio. 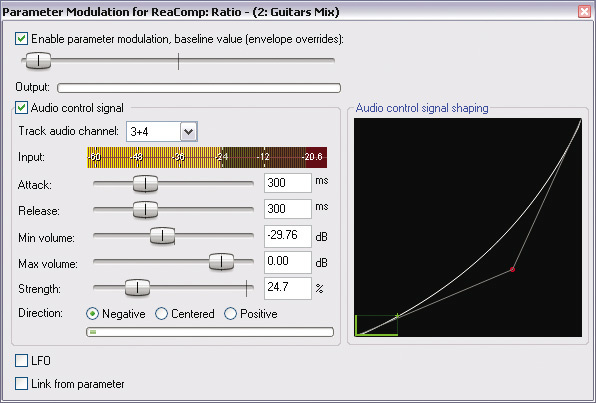 Open the parameter modulation window for the compressor ratio. This should resemble the screenshot above. Most of these settings should already make sense to you, but the following are especially interesting. The baseline value fader has been set way over to the left, to set a baseline ratio of 4:1. If left in the centre it would have been around 50:1! 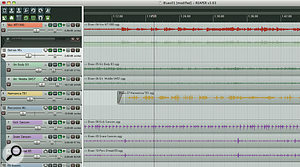 The audio control signal is set to channels three and four, the receive from the vocal track. Notice how the audio control signal shaping has been set. In this case, the effect is to lessen the extent to which the ratio is adjusted. We'll explore the topic of audio control signal shaping in more detail when we revisit parameter modulation in a later article. Finally, let's turn to the harmonica. This track has a receive on channels three and four from the vocal track. There is a compressor in the track's effects chain, but this is primarily used to tame some of the more extreme audio peaks during instrumental passages. The ducking is achieved using EQ alone. Instead of using the vocal signal to compress the harmonica, we are using it here to attenuate the harmonica at certain frequencies where it most noticeably appears to clash with the vocal. Compare how the song sounds with EQ engaged and bypassed.Study the parameter modulation settings for the EQ Band 4 gain, as shown on the left. These make use of one control that we have ignored up to now: Max Volume. Set at about ‑16.0dB, this is a ceiling for the controlling audio signal, above which no further attenuation will be applied. This resolves the possible issue of ducking being applied too aggressively as the voice grows louder. We've seen three examples of the use of parameter modulation. Each is effective, but their real power comes from working together. You'll find it helpful to download the project file mentioned in the article, Blues01.RPP, which is available from /sos/oct10/articles/reapertechmedia.htm.